January 2018 saw Rossendale Borough Council become the latest in the dwindling band of local authority municipal owners to sell off its bus company. Transdev Blazefield were the successful buyers and twelve months on seemed a good time to have a look around the network and see what’s been happening. Quite a lot is the answer. In fact, a hell of a lot is the answer. 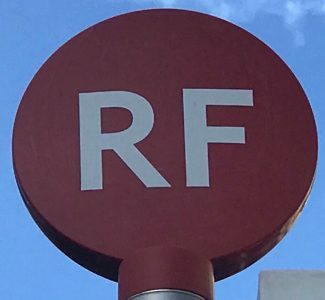 It was as recently as 2014 the much welcomed Best Impressions ‘Rosso’ makeover ousted the somewhat dated Rossendale Buses brand to brighten up the streets of Rossendale, Rochdale and Bury. I remember thinking how fresh and transformational the new bright red livery with its white and orange Rosso logo looked among a sea of First Bus light grey, faded pink and dull purple on a trip to the area a few years ago. Yet now, less than five years later the Rosso brand looks underwhelming compared to the new colourful route brands (again designed by Best Impressions) launched during the first busy twelve months of Transdev Blazefield’s ownership. Tottington Line was the first attractive new brand applied to a fleet of off the shelf sparkly new Streetlite buses introduced last April on route 469 shuttling up and down on the efficiently timed route between Bury and Tottington. I took a ride in its first week of operation last year and was very impressed. Ten months on it’s still looking fresh, smart and as welcoming as it did during launch week. Three further new route brands were introduced last year; one on a fleet of new Versas for the 464 between Rochdale, Bacup, Rawtenstall and Accrington, another applied to the six Streetlites bought by Rosso in 2016 for the Rochdale to Littleborough circulars 456/458 branded as Lakeline while the third new higher profile route brand, ‘red4’, is for the Bury to Ramsbottom route. Hollingsworth Lake on Lakeline 458 is a particularly lovely spot and all the better for now having a high profile branded bus route to make it stand out. A recent revamp of the route includes an extra two buses an hour running direct as a 457 between Littleborough and Rochdale competing with First Bus route 457 (and 454) at four buses an hour along the same road. Two more attractive brands were introduced last month: ‘trax’ for Bury to Rochdale routes 467/468 and ‘irwell line’ for the Bury to Rawtenstall and on to either Blackburn (481) or Burnley (483) routes. ‘trax’ uses four year old Streetlites transferred over from Burnley in an attractive orange livery while ‘irwell line’ has refurbished ‘as new’ Wright Eclipse bodied Volvo B7RLE which belie their twelve years age. If you didn’t look at the registration plate you’d think you were in a new bus, helped by the excellent treatment of the interiors which all incorporate attractive easy to read maps, ticket prices and useful succinct information. The key to successful cove panels is keep the message short and simple – these are exemplars of the very best. By designing the interiors to a common house style it becomes obvious that the attractive new brands are part of the same ‘company family’. My day’s travels round the Rosso network yesterday saw some excellent customer service skills from drivers, impressive punctual timekeeping and displays of attractive promotional timetable leaflets at bus stations making for a welcome contrast with TfGM’s bog standard black and white print outs. However a word of praise for TfGM for their bus stations which really are the business. Relative recent builds at Rochdale and Bolton are hugely impressive – literally huge too. Together with Bury all three sites visited yesterday had manned information desks and a range of other facilities including retail and toilets. It’s just a shame the toilets seem harder to enter and exit than Alcatraz! Still, it is only 20p a time but with no change given you need a pocketful of coins these cold winter days requiring multiple visits in a day (!) – not easy in a contactless world! And of course these bus stations are in the Premier League compared to the appalling relic from the 1970s bottom of League Division 2 bus station in Rawtenstall. Thank goodness there’s finally news the Borough Council have plans for a replacement opposite the current dilapidated site. As Michael Watson tweeted, the current relic needs shipping straight to Beamish Museum! It’s not just past it’s prime, it’s “pushing up the daisies” as John Cleese would observe. From my travels yesterday it’s evident Rosso has experienced an exciting first twelve months under Transdev Blazefield ownership and if I know CEO Alex Hornby* it’ll be an even more exciting (and ‘amazing’) second year ahead. I have absolutely no inside knowledge or even any hint of possibilities but reports First Bus are seeking bids for their Manchester operations will surely be of great interest to Transdev, not least the operations between Bolton, Bury and Rochdale, which are a perfect fit for Rosso’s ‘South East Lancashire’ network. However there are two counter considerations. While Manchester was noticeably booming when I arrived late on Friday afternoon the same can’t be said for the area north of the conurbation. Talk about the ‘death of the High Street’ is old hat for Rochdale. Closed shutters outnumbered open retail units when I visited some years ago before Metrolink got extended beyond the rail station and it didn’t look much different riding the tram down to the town centre yesterday. Except to my pleasant surprise I was encouraged to see work well underway on ‘Rochdale Riverside’ adjacent to the transport interchange and tram terminus. This “will create the prime core in the heart of the town centre” including “a M&S department store, retail and leisure units, kiosks, 6 screen cinema and an adjoining car park around inspiring public realm”. If it achieves what a similar development called ‘The Rock’ has done in revitalising neighbouring Bury, then it could be the saviour of Rochdale as a place to visit. Good luck Rochdale Riverside. The second factor is of course TfGM’s desire to introduce bus franchising which they’re currently spending an obscene amount of money (£11 million) investigating. Interestingly Mayor Andy Burnham has not actually fully committed himself to such a regime change so it’s all to play for as his initial mayoral term marches on a pace, ending in just over twelve months time. The bus operators are fighting a rearguard action talking up plans for huge investment in electric buses (Stagecoach) and working together under a new ‘one bus’ brand to make it easier for passengers to navigate their way around. I was expecting to see the new logo emblazoned across all colours of buses ousting the beloved (!) corporate Arriva, First and Stagecoach brands, but instead espied it among a plethora of window notice overload on a First Manchester bus. Surely that’s not it? Unsurprisingly I didn’t see it sullying any Rosso buses from Transdev Blazefield and don’t expect to. Indeed it might just be that an opportunistic expansion with further excellent attractive route brands across this part of north Manchester and a plentiful supply of promotional leaflets is just the encouragement the Mayor needs to put any risky franchising plans firmly on the back burner. It’s a risk I hope Transdev will be emboldened to take and let’s hope their bid offer is currently on its way to Aberdeen. It’s looking like it’ll definitely be an interesting year two for Transdev Blazefield’s Rosso. First, as a business, both locally and nationally are a textbook example of how not to run a business. Whilst I don’t particularly buy into all the ‘amazingness’ is the genius of one person, I do appreciate that there is a remarkable turnaround story here. I do however wonder if the good burghers of Burnley appreciate their Streetlites being mysteriously whizzed away to further in to Lancashire? What is there ‘amazing’ replacement? I am amazed that Stagecoach can make £18 million profit from the southern part of the old GM Buses empire, but First can’t make a penny bean. I wonder how much corporate debt has been placed on the opco? In an ideal world, Stagecoach would snap up Oldham and Transdev would get Bolton, with the two of them sharing the Manchester routes between them, ending with the closure of Queens Road. That way, there would be good connectivity on each network, with little overlap on their current pattern of service. I think this blog is very interesting. However the animus against regulation / franchising etc is bewildering. Living in London I thank heavens I live in the only place in the U.K. ( ok apart from Northern Ireland) with a functioning, integrated public transport system. Deregulation has not worked. In fact it’s been a disaster. Even when London had no money as I recall in the 1990’s our network was miles better than anywhere else I happened to visit in the country. Mr French your approach is particularly puzzling because as a well regarded manager of a deregulated bus company you did seem to behave as though you were the sort of very competent public sector bus planner and operator who would do wonders for a regulated integrated network. B&H was relatively stable as well. I wonder if this is one of the problems? I do sometimes think that bus enthusiasts love the deregulated U.K. bus market because there is always something going on. But if you want to really grow the bus market and generate modal shift from car to public transport then a great deal more long term stability is essential in the bus offer. The constant upheaval whilst great fun for enthusiasts does nothing to persuade people that they could or should give up the car. Mr French you should be given the job of running Manchester’s franchised bus network – you could do wonders for it. Im touched and flattered by your great confidence in me, thank you! I’m encouraged by some excellent managers doing their best up and down the country to provide attractive bus networks (eg as I saw in Rosso) and I’m not sure regulation will solve many of the challenges these managers currently face, but very interested in your thoughts and many thanks again for your contribution. Apart from the Tottington Line, none of the buses seem to carry any external mention of the fact that they are all run by Rosso. Is it clear to casual or prospective customers that there is a network with interavailable tickets, rather than each brand being viewed as a separate operation?